Set of 4, 4 1/8"Glasses Each Heavy Weighted Glass Holds 11.8 Liquid Ounces. Dishwasher Safe Quality Crystal Made In Germany With Refined Style As Well As Debonair. Exquisite Barware Perfect For The Sophisticated Drinker Created To Add Elegance To Your Drinkware Collection. These are the ASTON design, very classic, sparkles nicely, easy to hold. Made in Germany, heavy crystal. This is a nice Ralph Lauren Aston old fashioned glass. I have 4 available and the price is for one. They are all new and in new condition. This glass is 4 1/8" high. 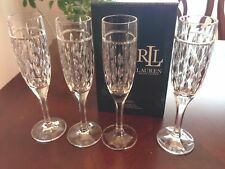 Up for sale is 1 boxed set of 4 Ralph Lauren Aston crystal champaign glasses (flutes). Box has only been opened once, in excellent condition with no tears, ready for gifting. RALPH LAUREN ASTON HIGHBALL GLASSES. Classic Aston design. Etched RLL on the bottom of the glasses. Fine Crystal made in Germany. New in box. These are the low DOF or double old fashioned size. These are the ASTON design, very classic, sparkles nicely, easy to hold. New Boxed sets of 4 - you get TWO sets totaling 8 glasses. Made in Germany, heavy crystal. These are the ASTON design, very classic, sparkles nicely, easy to hold. Made in Germany, heavy crystal. New Boxed set of 4. RALPH LAUREN ASTON DOUBLE OLD FASHIONED GLASSES. Classic Aston design. Etched RLL on the bottom of the glasses. Fine Crystal made in Germany. New in box. A pair (2) Ralph Lauren Aston Double Old Fashioned Crystal glasses. Beautiful crystal. Very Clean crisp look. See pictures for more details. Both glasses are signed on the base. Beautiful cut design. These are the low DOF or double old fashioned size. These are the ASTON design, very classic, zig-zag pattern, sparkles nicely, easy to hold. Made in Germany, heavy crystal. Here is a set of four Ralph Lauren crystal (made in Germany) old fashioned / whiskey glasses in the ASTON pattern. These are new, never used. Asking price is for four glasses in their box. 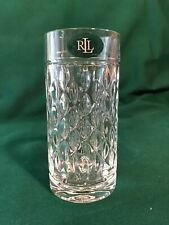 One Lauren Ralph Lauren ASTON Old Fashioned Bar Crystal Glass. Excellent condition with no flaws. Brand NEW Boxed Set of 2 Ralph Lauren Aston Crystal Glass Champagne Flutes. Shipped with USPS Priority Mail.In new condition, only took out of the box to take pictures. Ralph Lauren Aston Crystal Champagne Flute. 4 Signature Ralph Lauren Aston Champagne Flute. Aston pattern. ASTON FINE CRYSTAL. FLUTE CHAMPAGNE GLASS. RALPH LAUREN. 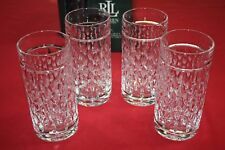 Here is a set of four Ralph Lauren crystal (made in Germany) highball tumblers in the ASTON pattern. These are new, never used. Asking price is for four tumblers in box. Box may show wear and tears (like pictured).